Not that I imagine either rule set needs any introduction, but for the sake of formality, Black Powder (Warlord Games) rules cover 1701 - 1898, bringing fast play to large tables in which units are generally battalions / regiments, organised into brigades, with three of more brigades on the table per side. 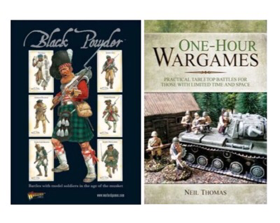 One Hour Wargames (Neil Thomas) are a collection of minimalist rules, covering nine periods and supported by thirty scenarios, which only need a playing area of 3' x 3' and have between four and six units per side. This post is going to take one of the Neil Thomas scenarios and play it with both of these rule sets. How does the minimalist approach of OHW compare against a longer rule set in terms of the game, period flavour, complexity, realism and engagement etc? Being something of a Christmas special post, I will by trying something new by combining a text write up, interspersed by video clips. This is something of a monster post, the intention of which as much as anything else, is to provide an entertaining post on Christmas Day, when generally, new wargaming material is a little thin on the ground. The origin of this post comes from a few pertinent lines in the first chapter of Neil's book - "Readers should always bear in mind that simple rules are not necessarily unrealistic, which all too common misconception has resulted in some monstrously turgid and hideously complex rulebooks being produced in the name of realism" .... There, I knew that would get your attention. These days I generally stay away from anything that has even a slight sniff of being a "monstrously turgid and hideously complex rulebook", though my sense is that generally modern rules have seen a greater drive towards playability over complexity. So rather than pitting Neil's rules against a complicated set, I thought instead, I would take one of these modern and popular publications and just run it along side what the Neil Thomas rules are doing. I have chosen Black Powder, as I have them, like them and they are sufficiently wordy, with a full enough system to look at whether some extra detail and comparative complexity helps or gets in the way of interesting play and outcome. I have always been wary of the term 'realistic' and statements that claim it. My own gaming pleasures come from having an 'engaging' game and since I often game in periods in which I have only a spattering of understanding, 'realism' generally gets an easy ride from me. Most games that I have enjoyed could probably best be described as heavily themed rather than realistic. They set out to do something that I don't think you will find anywhere else in commercial form - they properly strip rules back to a minimum and of itself this is an interesting exercise in analysing just how far one can go with such a process and yet still keep a recognisable wargame system. Truly the book is worth its cover price just to immerse oneself in that question alone. They offer a solid gaming platform, so the player is free to bolt on house rules that will bring the rules closer to their 'vision' of what they want the rules to do. They allow gamers who are strapped for space and / or have small forces to put on a game, even in the larger scales. Perhaps most importantly, their low complexity and fast play time ensures that gamers will actually play, even that (rare) midweek game and they can get the kids involved or just provide the sheer indulgence of a solo hour or less at the table, with minimal set-up / play / take-down time. 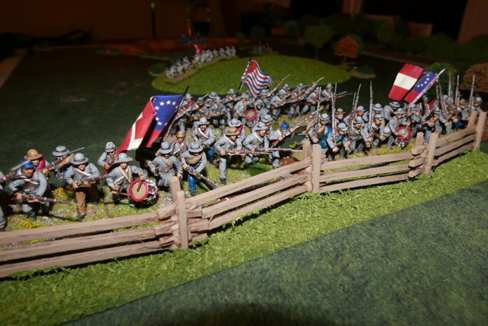 For the purposes of this post, I will be using the American Civil War rule set from OHW. They amount to just two pages of rules. I am going to take Neil's scenario 25 (Infiltration), simply because as the Union player (attacker - Blue) I have never been able to win the scenario. 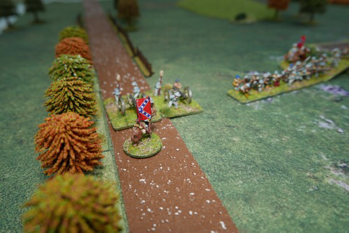 The Confederates (defender - Red) have always been able to deny the Union the opportunity to exit from the board due to successful blocking actions while destroying the Union force in the field. In my previous plays of this scenario the defenders have always had two elite units as part of their force and I think that has mattered in bringing the scenario balance in their favour. So in picking an OHW scenario that has previously been a struggle for one side, I am hoping it will make for a good game to see how Black Powder does. Of course, Black Powder is intended for much bigger battles, on much bigger tables and with forces organised into separate entities (brigades) that each have their own morale to consider - but the game is quite scalable and so hopefully this post becomes interesting purely in the meeting of these two fast play systems and the question as to what the extra rules are actually delivering. In the first instance, I must declare that I find the ACW rules in OHW stripped back a bit too far for my own liking, so I have introduced a couple of house house rules. These essentially give a Command and Control element and a Morale element, but they have been kept very simple to respect the philosophy of the rules author. However, in doing so, I acknowledge taking the first steps in reducing the 'purity' of our comparison, by making the OHW rules more interesting to me, rather than using them 'out of the box'. In any case, I hope the reader (especially those who use OHW) enjoys seeing how the house rules work out. For my morale rule, units always take a morale test after taking casualties, if they fail, they fall back and take an additional two hits. There are two reasons why I like this rule. Firstly, units (especially elites) feel too effective in terms of staying power if they hold a defensive position such as woods, but with the morale rule, as their casualties increase, there is a growing chance that they may be prised out of the position and forced to retreat (good). Also, by retreating they suffer an additional 2 hits. This is important because if they just retreated (no punishing hits), then the retreat itself often gives an advantage, because the gap opened up between the units now gives them extra fire opportunities against the attacking unit, making the attackers having to 'again' advance through a hail of fire. Finally, this time around, I would like to test the idea of using an Average Dice (2,3,3,4,4,5) as a fire dice instead of a D6, to reduce the effects of the 1 and 6 extremes in normal fire. Others have reported good success with doing this. For Black Powder, we will need to dispense with Brigade and Army morale rules because the forces are too small and we need to be compatible in this scenario with OHW, which allow a fight to the last unit if needed. Other than that, we will just need to apply the 'Elite' rule from BP's special rules, to the those units (three in our scenario) that the scenario designates as elite. OHW scenarios last for 15 turns and most units can cross a 36" board in six turns, with movement allowances generally being set at 6" (150mm). To be somewhat comparable, the scenario length for Black Powder will be set at 7 turns as that is quite typical for a BP game. This means that the Confederate reinforcements should arrive a little earlier in the BP game. As for measurement conversion, on first thought it makes sense to convert inches to half inches as this also allows an infantry unit to also cross the board in six turns. But in BP, depending on the command roll, a unit could move up to three times in a turn (or not at all! ), so to further reduce the impact of those large movement allowances on the scenario, we shall convert inches to centimetres instead. I shall also be using some of the ACW specific rules that are found in the Glory Hallelujah book (an ACW specific support book for BP), primarily the 'Fire Fights' rule, which makes the important change to the base game by only allowing a moving unit to fire if it just moved once that turn. Units that make a second or third move cannot then subsequently fire in the same turn. Also the 'Pour it on Boys' rule, allows a unit using smoothbore musket to get an extra shooting dice for closing fire and close range fire. On setting up the BP game, I will dice for each Confederate unit. For each six rolled, that unit will be armed with smoothbore musket. The following video gives an overview of the rule books that we will be using. Anyway - enough of this, on with the games. Firstly the scenario that will drive both games will be scenario number 25 (Infiltration) from the OHW book. 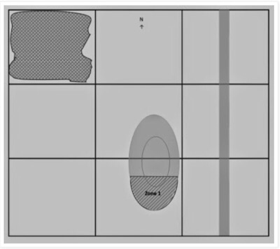 The schematic map is shown below, giving a 3' x 3' table. The OHW tables can look a bit sparse, so we will add terrain, just to look nice, but the added terrain will NOT effect the game in any way at all - it is just for show. Scenario Overview - A small force (blue) has penetrated enemy (red) lines. It aims to plunder the red army's supply network before they can react. The red army has 6 units and the blue 4 units. The game lasts for 15 turns and the blue army always goes first. From here-on-in, we will refer to Blue Force as the Union and the Red Force as Confederate. The following video clip discusses the terrain on the table. Confederate, 1 infantry regiment from 1st Brigade in zone 1 (the hill) facing south, with Major General Archer. Union units do not start on the map. Turn 1, all 4 Union units (1st Brigade) arrive from the southern edge within 12" of the south-western corner (bottom left on the schematic map above). Turn 3, Confederate, 2 units (the rest of 1st Brigade) from the northern edge (top of the map). Note for the Black Powder game, I will need to reduce this to a turn 2 arrival. Turn 6, Confederate, 3 units (the whole of 2nd Brigade) from the southern edge on the road (bottom of the map). Note for the Black Powder game, I will need to reduce this to a turn 4 arrival. Victory conditions - The Union must exit 2 units via the road on the northern edge. Anything else is a Confederate victory. The dynamic of the scenario comes from the Union having their entire Order of Battle (4 units) available at turn 1, while the larger Confederate army have just one unit (occupying a hill) on the table with the rest turning up as reinforcements from two different locations. The Union needs to both exit the board and deal with an enemy that is threatening their rear. To give me the same difficulties that I have always had with this scenario, the same forces that the selector generated in previous games will be used. The Confederates as defenders getting two elite units probably skews the scenario too much to their advantage, but such was the force that the selector once generated, so there we are! For the Black Powder game, I would like to rate the Union General 1 point higher (at 9), to better balance the Union force against the stronger opposition and to better ensure some mobility, but since the OHW scenario and rules do not recognise an advantage of any sorts, then neither shall I and so all command ratings will sit at a very generic '8'. The following video clip discusses figures scales for OHW scenarios. UNION - Order of Battle. The entire Brigade (plus the army commander) is available to enter the table on turn 1. For the BP game all Union infantry will be treated as though having rifled muskets. CONFEDERATE - Order of battle. 2 x Elite Infantry Regiment - come on as turn 3 reinforcements, together with Scott (turn 2 in the BP game). The Brigade is the turn 6 reinforcement (turn 4 in the BP game). For the BP game, at the start of play roll a D6 for every Confederate regiment. On a result of '6' the unit is smoothbore musket armed. On any other result they have rifled muskets. Those with smoothbore will abide by the 'Pour it on Boys' rule (Glory Hallelujah supplement), which essentially gives the unit an extra shooting dice when using closing fire or at close range. This is meant to represent that the smoothbore was easier and faster for experienced soldiers to load when under the stressful condition of being in such proximity with the enemy. For the BP game, the restriction (from Glory Hallelujah) that only troops that move once may subsequently fire, will be used. Those that move twice or thrice in the same turn cannot fire after movement. In OHW, the elite regiments conform to the Zouave rules and in BP they use the Elite 'useful rule'. The following video just gives a quick video for a visual look at the forces involved and where they will arrive. The following video clip describes the forces we will be using. Game 1 - One Hour Wargames. The Union have three things to consider. (1) the Confederate unit that is presently on the Hill. (2) the turn 3 Confederate reinforcements that will enter at the top of the map and bar the Union exit from the board. (3) the turn 6 Confederate reinforcements that will enter on the road from the south and either join forces with the unit holding the hill or move north to harry the rear / flank of the Union trying to exit the board. General Webb (Union) decides that two regiments will take the hill and two regiments will press on north to take the woods and deny this defensive position to the Confederates. Once the hill is secure, one regiment will remain in that area as a rearguard and the other will move north to support the rest of the brigade. 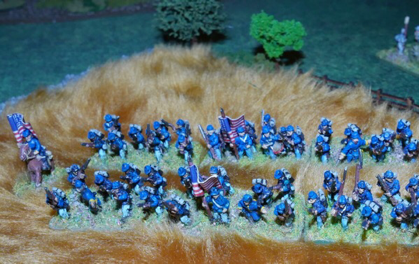 Since the southern reinforcements will not arrive until turn 6, the Union forces should be close to fighting to get off the board by that time (This is a slight variation on the plan I have repeatedly applied in the past and failed!). Importantly, in OHW, units cannot fire and move in the same turn. The course of this battle is shown in the below video clip. To help compare the feel of game that both systems give, I have decided that the Union will adopt the same plan as in the previous game. The big obvious difference right from the get-go is whether Union formations can pass their command rolls to get their forces moving and whether they can get to enjoy some of the rather large movement allowances that this system generously gives. Nothing can be taken for granted in this system. The course of this second battle is shown in the below video clip. In his book, One Hour Wargames, Neil Thomas questions the need for more complicated rules in the name of achieving better realism. His position is that one does not necessarily lead to the other to any greater degree that a more simplistic set might give. Against that background he strips back his rule sets in this book to what might be considered a bare minimum, but the result is still clearly delivering a wargame. We all take different positions on the matter of what is acceptable complexity, but his book if nothing else, is a fascinating examination of the subject. For my own part, although I really appreciate the brevity of the rules, I am left feeling that their cuts go a step too far for my enjoyment and through house rules, I have introduced elements of simple morale and command and control (see resource section below) to add an extra level of engagement. I also feel that limiting troop types to just four types in each period feels less representational than I want, though in the ACW period, it is not an issue, other than oddly calling elite infantry - zouaves. The aim of the post was really just to look at two fairly simple systems and compare them in terms of outcome and see to what extent the amount of rules overhead influences how a game 'felt' to play. In some respects, the purity of my seeking that comparison has been undermined by my adding a few basic rules to OHW while also using BP in an environment it is less happy with (i.e. a small table and just four - six units per side), but hopefully something of the original intent is preserved. OHW is very concisely written, there is no room for unnecessary verbiage, though the 'slim' effect of the rules can in turn can lead to some uncertainty in design intent when some situations are met and there are some areas that are not explained at all that either leave a knowledgeable wargamer to fill the gaps (such as no line of sight rules until you get to the WWII rules), or leave them slightly bemused that they can't seemingly do something that feels natural in most games (such as going into column formation for road movement and being disadvantaged for combat when doing so or dismounting cavalry or spending time to limber / unlimber artillery). But of course the robust nature of the rules mean that you can add your own rules with ease, though if you end up adding a lot of rules, you may as well be playing another set that might better suit your needs, as OHW starts to then leave the essential minimalist ground that is its crown. My adding of morale rule had quite an influence on our replay game and was important to my enjoyment of the scenario. Black Powder goes in the opposite direction, sometimes with enough verbiage that the chatty friendly (and sometimes pointless) banter can annoy or get in the way, though some see this as an actual charm. The OHW combat system can give a generic sense that one doesn't care about their units too much. You push them into action and as they rack up hits (towards the 15 that simply removes them from play), you start to feel 'can I get one more round of shooting out of them before the melt away'. By contrast, BP does have a rally rule to try and recover hits and the hits themselves have a graded effect on impact. If Brigade Morale is used, players are concerned about losing too many regiments, as the brigade morale will collapse, resulting in the removal of all the brigade's regiments, so the player is encouraged to recover hits or cycle fresh regiments into the line while tired ones recover or at least stay out of harms way. Units can absorb a few hits (up to their stamina level) and then they go shaken (with penalties) and then further hits cause Break Tests and the number of hits accrued effect this, as does disorder status - so the nuances created by this type of combat are much more interesting that the 'bang, bang you're dead' nature of the OHW system, though if you do not need the superficial nuances, Neil Thomas' approach that all these extra rules ultimately lead to the same place as his own simple accumulation of hits and then destruction, is probably a justified opinion. I suppose we are playing a game for the pleasure of itself and for some, it is their own level of engagement with the rule system that actually matters most, not just outcomes. In that regard OHW certainly has its place, there are a huge numbers of gamers (including those who still think of themselves as gamers, but in reality play rarely or have stopped playing altogether), who have limited space, time and figure collections. Throwing a quick game down that plays out in forty minutes or so, that doesn't require a lot of rule referencing, especially if you have not played for a few weeks, is exactly what you may be looking for. If it actually gets figures out on the table and creates some quality hobby time, then it has magnificently succeeded. Considering these rules are just two pages long, I feel it fair to say that the author has done something pretty significant. BP has similar ambitions of playability though in a different direction. It seeks to allow bigger games with more figures to play to a conclusion in say a full evenings gaming, even with multiple players. It is more demanding in terms of rules and system knowledge and also supports a wider range of troop types and capabilities, but in doing that, it does (or rather can) bring more character to play. In its own basic format, it is seen as a generic system (often described as a toolbox) and it is for the player to add on the provided special rules and traits to the scenario and individual units to give the right period or battle feel for the player(s). OHW is very much self contained. You buy the book and that's it. I think it plays better for periods that are of a secondary interest to you, as you are more likely to be forgiving or unaware of what is missing, but for a prime interest, you may find yourself liking the system, but wanting to modify and add to it. I feel a bit like that with the WWII section. BP on the other hand travels the codex path. You don't have to, but players will likely buy one or more of the additional books that give the period feel etc that this 'toolkit' set of rules so readily opens itself up to. I generally dislike codex systems, but I do like the BP books, they are simply nice things to own and browse (Rebellion being my favourite to date - AWI). Both games play fine solitaire. For mechanics, BP has the edge due to the variables in command allowances that play out into variable movement and the possibility of having to roll on the Blunder Table (like a chaos events table). From a resource perspective, OHW has the edge in that it uses a smaller space and providing forces for both sides and small amounts of terrain is easier and cheaper. So there we are, both sets have their place and their followers and both sets can claim to have given many a happy wargaming hour or three - which is a very good bottom line. At the price of the OHW book, it deserves a place on a wargamers shelf, it can be likened to doing something similar that the Don Featherstone books did 40 years ago. Even if you decide you don't like it, getting to that point and evaluating the question of excess rules is fascinating in its own right and will make you review your own rules writing and rules collection. Plus the book has 30 scenarios which are fun, sort of in the teaser tradition. BP likewise deserves a place on the shelf, but for different reasons. It is dearer, so of course your views on value for money will have a greater influence as to whether this should be bought for its own sake. The mechanisms are simple and robust, moving units around the board and changing formation is simple (no wheeling - hooray!) and the idea of bolting specific rules on for various units is very characterful. Aside from that, It is a lovely thing to own and can make for an enjoyable cover to cover read. If it forms the basis of your black powder period gaming, then it is of course great value. I like to take my copy off the shelf and just browse it and enjoy the pictures, I don't have too many books that I do that with. I do like that I care about each die roll and what it may or may not deliver and that starts from the very first roll. In our case today, it was "will I get the Union forces onto the table" or "will that force withstand that charge or make it into contact", that is the sort of engagement and narrative with a scenario that I am looking for. As I looked at the Black Powder video for editing, I took a few quotes (repeated below) that tend to show the narrative quality that the game gave. The way systems can bring about situational awareness through narrative is one of the things that I look for when deciding whether the rule balance between complexity and engagement is likely to fit with my own view of gaming pleasure. 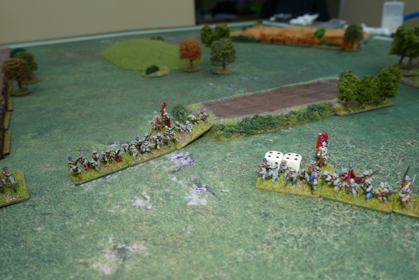 "He is just siting on his hands, we don't know why that is, perhaps he is cautious or perhaps he wants to see how this battle plays out on the hill"
"I agonised about this before doing this"
"Well, the end of turn 2 was a surprise"
"General Webb has eventually managed to get his two regiments moving"
"Webb suddenly came to his senses and he made an amazing 3 moves in his turn"
"that lovely open flank of the Confederate unit, but the unit [Union] is disordered and cannot do that [cannot charge into it]"
"Again, they rolled a Blunder, which saw them skedaddle back down the road for 2 moves"
So, is Neil Thomas right to say that some rules are unnecessarily complicated in the pursuit of realism? - I think he is (I have owned some really complicated systems, but the term 'owned' rather than 'own' tells its own tale), but I don't feel the rules in OHW are an outright solution to that, as for my money, I like a little more engagement with my rules and I felt that my game with them today needed the added house morale rule to bring to a level of satisfactory engagement for me. Of my two games I played here, I enjoyed the Black Powder game more, simply because the extra rules brought a more nuanced game, while still staying within the bounds of what we might term a low complexity system. At two pages, the OHW rules fascinate me and it does make me wonder what he could have done with 4 - 5 pages of rules per set instead. I imagine, he would have had the complexity argument nailed and the likely clever result would have just pushed the rules into territory that would have further expanded his audience of fans. So from my own gaming perspective, I would say that OHW has been an impressively refreshing read, though while I like what Neil attempts with his rules, I invariably feel tempted to add to them, to move more towards the territory of Black Powder and I wish that he had just loosened the strict controls on complexity a bit more - though I also highly regard and respect his self control in not doing so and sticking with his own brief, as he does deliver something very different, which is quite refreshing. The Black Powder game had more nuances. The command variables added a sense of suspense and the rules for things such as charging and changing formations, collectively are more engaging as another level of decision making is needed. 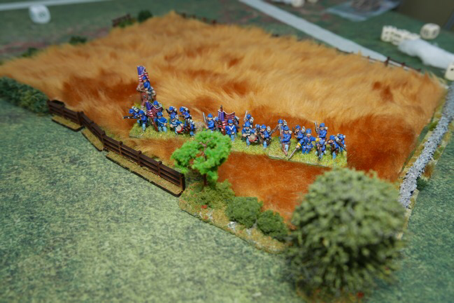 But of course the basic Black Powder game was also subject to modifications, most significantly the 'move only once to fire' rule (as given in the Glory Hallelujah set) and in that regard it is similar to One Hour Wargames, as the player seeks to bend the game to their notion of 'realism'. As I close, I think it is worth reminding the reader that though I did prefer the Black Powder game, the One Hour Wargames game was enjoyable and was running off just a two page ruleset, together with a couple of house rules - impressive to say the least, especially as here, it is being compared with a fuller system that runs to dozens of pages of rules. Everything has its place and we are indeed fortunate that we have so much choice ..... there really is something for everyone! Each player also gets one or more leaders as the player feels reasonable to represent a command function (usually 1 for every two units or a brigade). A leader has a command radius of 12 inches. Leaders must be placed with a unit. If the unit is removed from play, a surviving leader must be immediately moved to the nearest friendly unit that does not already have a leader. Units within command range of a leader behave normally within the rules. At the start of their Movement Phase, those outside a friendly leaders command radius must test to see whether they can move this turn. Roll a D6 per such unit, deduct 1 if the unit is more than 18" away from the nearest leader. On a score of 4 or more, the unit behaves normally. On a score of 3 or less the unit cannot move this turn other than to change facing. Whenever a unit with a leader attached is attacked in any way, roll a D6, on a score of 1, the leader is killed and removed from play. It is immediately replaced with another leader, who will have a command radius of 6" lower than the leader just killed. A leader with a command radius of zero can only command units that they are attached to. At the END of each friendly fire phase, all enemy units that suffered casualties from that phase must take a morale check. Roll three D6 if the total result is more than the number of casualties in total that the unit has presently accrued then the unit passes the test. If the unit fails the test, it must retreat 6" directly backwards AND take two extra casualties, though these casualties do not force an immediate further morale test. If a unit cannot retreat the full move due to any impassable obstruction, it stops at the obstruction and suffers a third casualty instead. Zouaves represent Elite units, they always add +1 to their morale rolls. Roll an Average Dice (2,3,3,4,4,5) instead of a D6 to calculate hits (if defenders claim cover, round up any fractions in favour of the firer - as per the normal rules). Very good post Norm. I have both books and each has its advantages and disadvantages. Personally I think OHW is too simple in its mechanics; his other books, especially the 19thC one, are much, much better. It does have the advantage of a fine selection of scenarios and is a great intro to wargaming for new gamers. I'm happy I bought the book although I don't play the rules. BP on the other hand can seem a bit daunting to get to grips with, but if you don't over do the 'add ons', gives a great game. 'Hail Caeser' on the other hand we have struggled with; maybe just a bit too complex for our liking. Thanks for taking the time to post this Norm and have a great Xmas. Great post! Thank you very much for all the time and effort you put in it. Two rules, two games, two outcomes. Brilliant but you could use more trials. Perhaps, even a factorial experiment to isolate all of the variables at work. Just kidding, really. Did you consider playing RAW without any House Rules in an effort to discern author preferences or design philosophy? Norm, that is one impressive piece of work! For me, a real test in comparing different rules is to replay the same scenario under each ruleset making notes along the way. This method is an excellent means of seeing what works, what doesn't, and where your preferences lay. Exactly as you have presented so well here. Oh, did I mention this is an impressive undertaking with first rate analysis? I did something similar a year or so back. I took three rulesets and replayed the same scenario with each. My conclusion was that OHW was the weakest of the three. Not bad by any means but the other two offered more granularity with more interesting decision points. I found OHW's real value is in the 30 scenarios although it delivers as advertised. That is, allows for a good game in about an hour. One more time, Norm, great piece of work! I hope to see more of this type of replay analysis from you! Thanks all, tackling a post this long was quite an undertaking (for the reader as well), but I think it fits in with doing a Christmas Special. If this had been Neil Thomas only book, I would likely be more critical of the rules, as they are too slim for me, but as I know (and own or have owned) his other works, he was clearly doing something here that was very different and very intentional or rather a more extreme exaggeration on his normal take on rule writing - I doubt we will commercially see anything like it again. Of interest is just how often games from this book are cropping up in various blog posts, often modified versions, but they do seem to be inspiring both play and having people being sufficiently moved to write about them. As Jonathan and Steve note, the 30 scenarios are probably what helps this book the most, they are of the teaser variety and I think there is an appetite for that. My games without house rules have felt too bland and generic, though I have noted other accounts of people who have thoroughly enjoyed their game and there is a chap who has started a blog about starting to game with his young son and all his posts to date have been based around this book and there-in I think lays its greatest strength. I have quite enjoyed the thing about embedding video into text and will no doubt try that again in the future. My next big project is to either show Black Powder being converted to hexes or to do more with by own beta version of ACW hex rules. I will likely pursue the latter. Thanks to everyone who takes the time to go through the entire post - regards Norm. Thomas' book on 19th Century wargamng is one of my favorites OF ALL TIME. To me, clearly destined to become a classic work on wargaming count meeting with the likes of Grant, Featherstone, Wesencraft, and Morschauser. Your videos make following the action in each BatRep very effortless. As I watch each video, I am reminded just how much work is involved in WRITING a BatRep. Perhaps, a video BatRep is as much effort but writing seems much more onerous. What you have accomplished in a fifteen minute video clip would take me much, much longer to put into words. We play a lot off OHW Rifle and Sabre at our club. With the scenarios we find them superb and give a good game with a few basic adjustments. We play War of the Pacific and Russo Turkish War 1877. In the New Year we hope to use Neil Thomas's 19th C rules for larger games. Nothing wrong with simple rules that work and give a good game and allow your own amendments. Why do rules have to be so complicated? I do now like the old school look to games. Have now gone through to the completion of the OHW battle. While I have looked through the M&P rules and the secenarios, this is the first play-through I have seen. You've mentioned elsewhere about recapturing the "old days" with simple rules and this example gives an excellent picture of what can be done to achieve that recapture. Like your implementation of morale (which increases casualties on failure). Thanks for post Norm. I read/watched it over the Christmas day and night in about 6 sessions (bit like my gaming really). Appreciate the effort you put into it and preempted any questions I had. (e.g. can you really compare if you expanded the OHW rules, how did you handle command differences in BP). My interest in AWI is low but my interest in rules discussion is really high! OHW RAW is just too simple for me, but will still play it as written with my daughter. And i do agree the scenarios in OHW are great - I really need to play them more as I am impressed with what people on blogs have said about them. Merry Christmas Norm, hope you had a great day! And a most impressive game and post, too! "At two pages, the OHW rules fascinate me and it does make me wonder what he could have done with 4 - 5 pages of rules per set instead"
You get the sets in 'Wargaming: An Introduction', which still leave you wondering (and house-ruling) some of the basics which at least Back Powder covers. Interestingly the morale system in those rules causes extra casualties and, in the ACW set, a retreat. 'Black Powder' is really a three-page set of rules padded out to thirty or more by waffle which sometimes obscures the actual meaning. Merry Christmas (belatedly) Kudos to you on this blog post and the video clips. A couple of years ago I included a short, impromptu, video in a battle report on my blog Stony Creek Surprise (Feb 2012) and rather enjoyed doing so but have yet to try it again. You have me thinking about a planned one again. Hi Norm, Thanks for this post, I really enjoyed it as a break from cooking the lunch. I'm still an OHW fan rather than BP but think your additional house rules work really well. Happy Christmas and thanks once again! Thanks all, hope everyone is benefitting from a few days seasonal break. I am using this uneasy lull between Christmas and New Year, to get my 12mm ACW bases 're-vamped' and touched up, so they are ready for their next escapade. I'm glad that the post generally seems to be enjoyed, though my YouTube stats are interesting in that, the OHW AAR video has been watched twice as much as the BP video! I'm not sure whether this means that some readers went back into the OHW video to watch it again, or whether some had had enough by that time and did not want to spend more time in the post. The viewing numbers suggest that there is an interest in SOME video support, but perhaps keeping that tight to just one or two shorter clips. Working that out is obviously important in getting the balance right between effort and benefit. A couple of days ago I received a supportive e-mail from a designer who liked the post and said he generally likes in depth analysis. We had chatted on a forum a few years ago, but nothing since ....... so how spooky, that very morning, I had already started to lay out the skeleton framework for a blog post on one of his systems that I own! Having found time to read and view this post. I must say I thoroughly enjoyed it and found the rule comparison really interesting, as I am a big fan of the approach OHW rules take. Could you explain what you mean by 'double jeopardy in rules' please? (I don't have that particular NT book yet). Thanks.